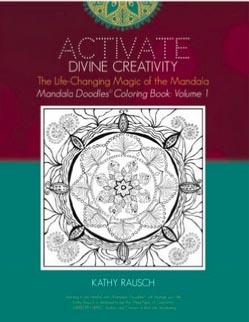 If you’re looking for a powerful and simple way to access an expanded state of awareness, Kathy Rausch’s book, Activate Divine Creativity: The Life Changing Magic of the Mandala is just what you’ve been looking for. Having experienced remarkable shifts through her own journey with mandalas, Rausch shares a map for exploration and allows the reader to delight in discovering their unique terrain. Writing with the ease and intimacy of a close friend, she offers a clear and rewarding path for everyone regardless of their confidence as “artists.” This simple yet powerful process is rooted in ancient tradition but is groundbreaking in its accessibility. For several decades meditation has moved from the esoteric margin of spiritual practice to mainstream culture. Too often, though, meditation cushions and prayer beads morph into decorative items instead of tools for deepening. With Rausch’s clear and effective guidance, there’s a new doorway (that’s been around for millennia) ready to be opened! The coloring book craze is an appetizer compared to the feast of rewards that emerge from creating a personal mandala. By following a few easy steps, each line and curve draw us into a field of presence. Kathy Rausch has integrated mature understandings of spirituality, creativity, and the power of the mandala into an engaging, wonderfully easy read. The concepts in this book are deep and profound yet delivered with an elegance and ease that makes them palatable to virtually any reader. Divine creativity is a part of our living essence, as Rausch beautifully demonstrates. Readers will be inspired to activate their creative power through the simple process of contemplating and drawing their own mandalas by following the instructions she sets forth with remarkable clarity. Having studied mandalas and their symbolism for several decades, I can attest to the deep psychological resonance and potency of mandala imagery as a vehicle for self-discovery and transformation. Rausch’s method maintains the classical design (a square enclosing a circle with four or eight radiating sectors), thereby preserving the integrity of a pattern that represents wholeness and includes among its metaphorical layers the unfurling of an eight-petalled lotus and, by analogy, the unfolding of awareness and awakening of the heart. Rausch adopts the ordered pattern of a traditional mandala as a vehicle for personal creativity, offering a simple template that provides structure and yet scope for creative expression. As a scholar of South Asian religions whose intensive study of mandalas has included field research and consultation of Sanskrit and Tibetan texts, I brought a specialist eye to Activate Divine Creativity: The Life-Changing Magic of the Mandala. I was surprised and delighted, then, to find that Rausch succeeded in crystallizing the mandala principle and rendering it accessible without trivializing or misrepresenting the subject, as so often happens in popularizing treatments of this sacred contemplative art form. The use of the term “doodle,” of current cultural coinage, helps readers understand that artistic skill and training are not required to undertake the practice she describes. 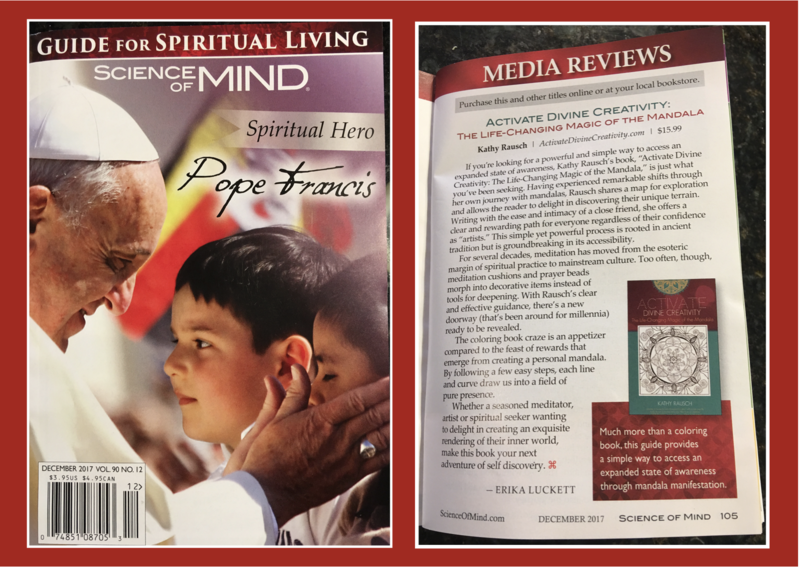 From my own efforts to communicate the principles and symbolism of the mandala to a spectrum of general and scholarly audiences, I recognize the challenge of addressing a broad readership on this complex subject. The genius of Rausch’s approach is her emphasis on “divine creativity,” which conveys a vital theme of the mandala tradition in a manner that is understandable and inviting for readers of any cultural background. The author’s voice is personal, captivating, and compelling. The lively pace of the writing carries the reader along on a sparkling stream of personal anecdotes, spiritual insights, and encouragement to embark on the revelatory journey of making mandalas with the ingeniously simple method she provides. Miranda Shaw (Ph.D., Harvard University) is the author of the award-winning Passionate Enlightenment: Women in Tantric Buddhism (Princeton University Press, 1994), which has been translated into seven languages, and Buddhist Goddesses of India (Princeton University Press, 2006). Her extensive field research in India and Nepal has been funded by the Fulbright Foundation, National Endowment for the Humanities, and American Academy of Religion. Shaw is Associate Professor of Religious Studies at the University of Richmond in Virginia and continues to research, publish, and lecture on the sacred arts of India and the Himalayas. I had absolutely no interest in mandalas until I read Kathy’s life changing experience with the art of mandalas. 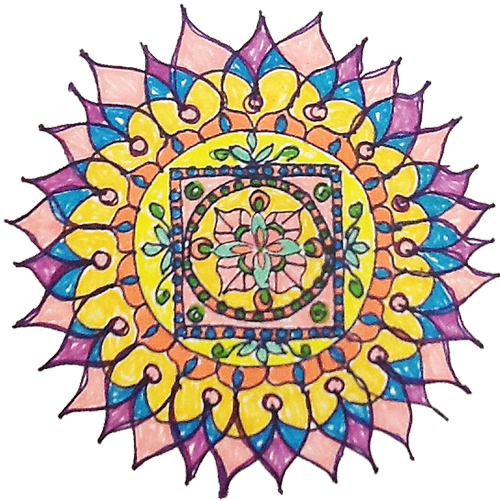 Kathy has a unique gift of telling her story, intertwined with mandala art. The delicate weaving of her unsettled life with the creativity of mandala art kept me engaged from the first word to the very last. It is a story you won’t want to miss – from being on the brink of ending her life – to her return to a life richer and fuller than ever through her creative expression with mandala art. This small book opens you up to be a bigger, braver you! In a unique and powerful way, Kathy shows you a way to be mindful and creative at the same time. Get ready to take notes! This book is rich with information you are going to surely want to capture! New awareness. Evolution. Possibility. If this is what you’re looking for in your life, then Activate Divine Creativity has entered your path at just the right time. Seize this opportunity and enjoy the ride as you evolve and grow with the assistance of the mystical, magical Mandala. Kathy’s techniques and guidance will help you become more creative, more alive and more fabulously YOU! One of my least favorite subjects in school was art. As a child, I liked to color, but I quickly learned that I wasn’t the best and never trusted myself to get it right. If you told me a year ago that I would be drawing mandalas, I would have said, ‘No way.’ I didn’t even know what a mandala was. Kathy Rausch has just rocked my world by assuring me that I am an artist, that I am creative and what I have to express through my “art” is beautiful and worthy. Kathy shares not only her talent and guidance, but a deep story about how art has essentially saved her, by connecting her to her inner thoughts and giving her a sense of order and peace. Whether you are an accomplished artist or like me—can’t draw a stick figure to save your life ~ rush to get this book. It will change your life. I love the way this book is written. Kathy is so authentic. I am passing my copy to a friend along with a new workbook in hopes she will do the same for a friend. This book could be very helpful to anyone in need of self-exploration. I didn’t know much about Mandalas before buying Kathy Rausch’s book in December. But I found out that I had been Doodling Mandalas for years in my notepads at work! This book has clear instructions on how to get started making real Mandalas right away. It is also quite thought provoking and meditative. Thanks Kathy!